Hull Writing: The Show Must Go On. Hull authors: Cassandra Parkin, Russ Litten, Nick Quantrill, Louise Beech. 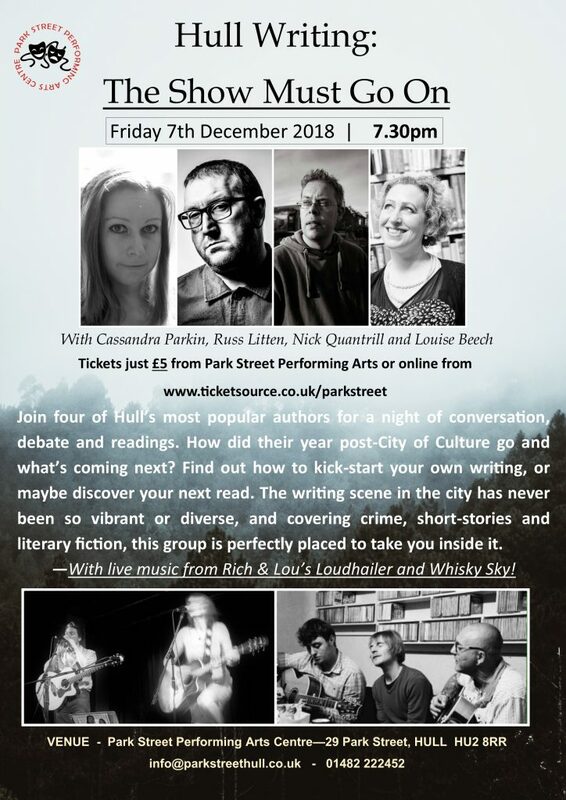 Sure to be entertaining and provocative in equal measure, join four of Hull’s most popular authors at the Park Street Performing Arts Centre, 7th December, for a night of conversation, debate and readings. 2017 was undoubtedly a chance for them to showcase their talents and develop new opportunities, but what’s happened to them since? Find out what they’re working on next and how to kick-start your own writing, or maybe just discover your next read. Hull Writers – The Show Must Go On. Be the first to comment on "Hull Writing: The Show Must Go On."